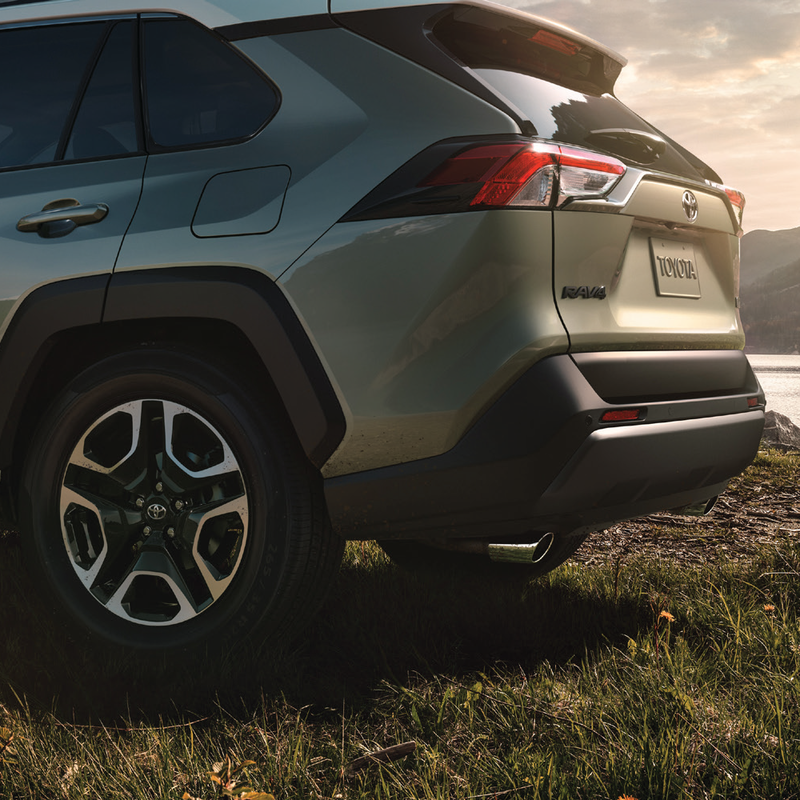 Underneath the 2019 RAV4’s rugged good looks are capabilities that reveal the potential of where you go, on- or off-road. From endless entertainment to thoughtful convenience features, RAV4 is filled with technology that keeps up with you. Its longer, wider stance makes the handling more responsive, while a stronger core gives you a ride that is smooth and confident. 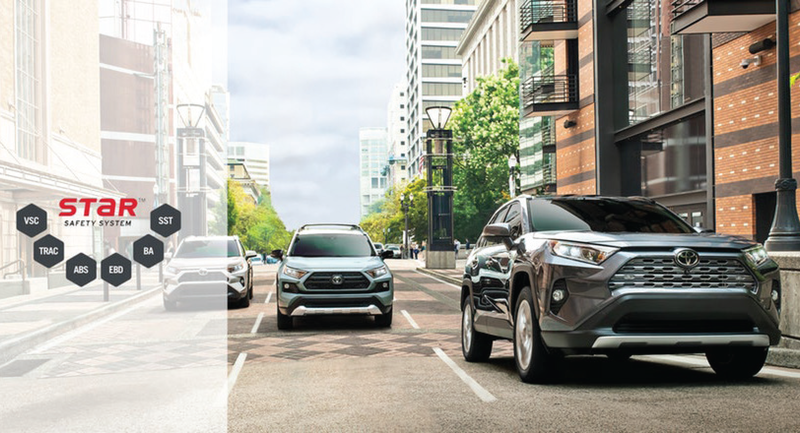 RAV4’s updated Toyota Safety Sense™ 2.0 (TSS 2.0) plus Star Safety System™ work together to help protect you and your passengers. RAV4 brings a new level of refinement that’s sure to impress wherever you go. The Dynamic Force 2.5-liter inline four-cylinder engine produces 203 horsepower for great acceleration. Pairing it to the Direct Shift 8-speed Electronically Controlled Automatic Transmission shifts the power smoothly and efficiently, with three distinct drive modes that let you tailor RAV4’s driving dynamics to match conditions. Full of personality, RAV4 sits wider and has an extended wheelbase that gives it an aggressive stance, while flared fenders and sharp creases add to its tough exterior. RAV4’s wheels are designed to complement every model’s personality and style. From the 17-inch five-spoke silver alloy wheels to the 19-inch multi-spoke super chrome finished alloy wheels. Experience a new level of refinement. Premium materials, like the available SofTex® seats and the comfort of an available 8-way power-adjustable driver’s seat with memory function, put you in the center of it all. The interior is filled with premium technology features and materials and reveals the attention that goes into every detail. 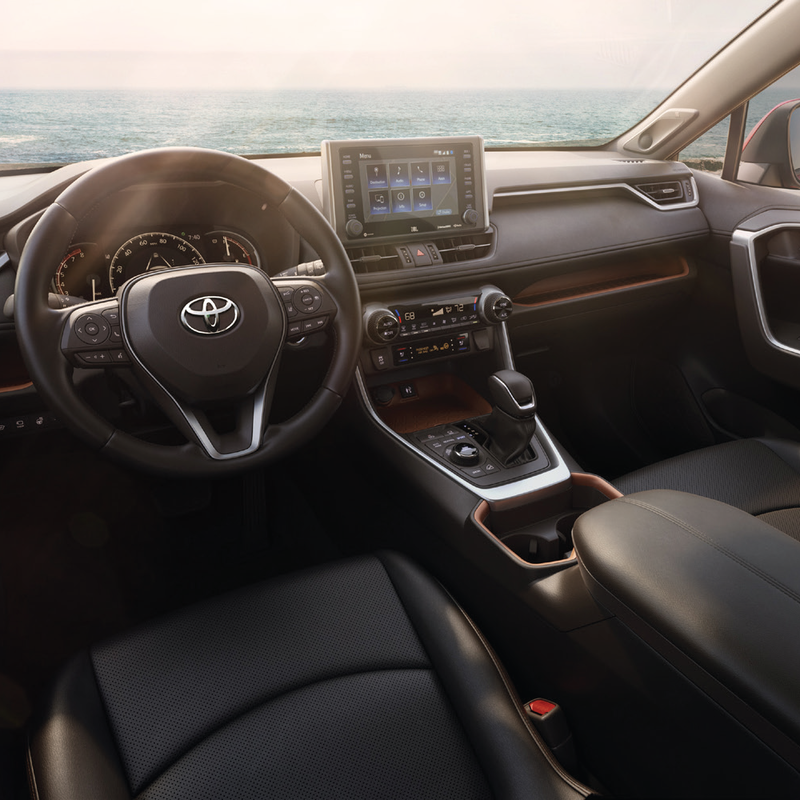 Instantly upgrade your connectivity and infotainment with RAV4’s new Entune™ 3.0 multimedia system. Wherever you go, you can always access the systems using the available 8-inch touch-screen. Connect your smart phone through standard Bluetooth® to make phone calls or stream music. 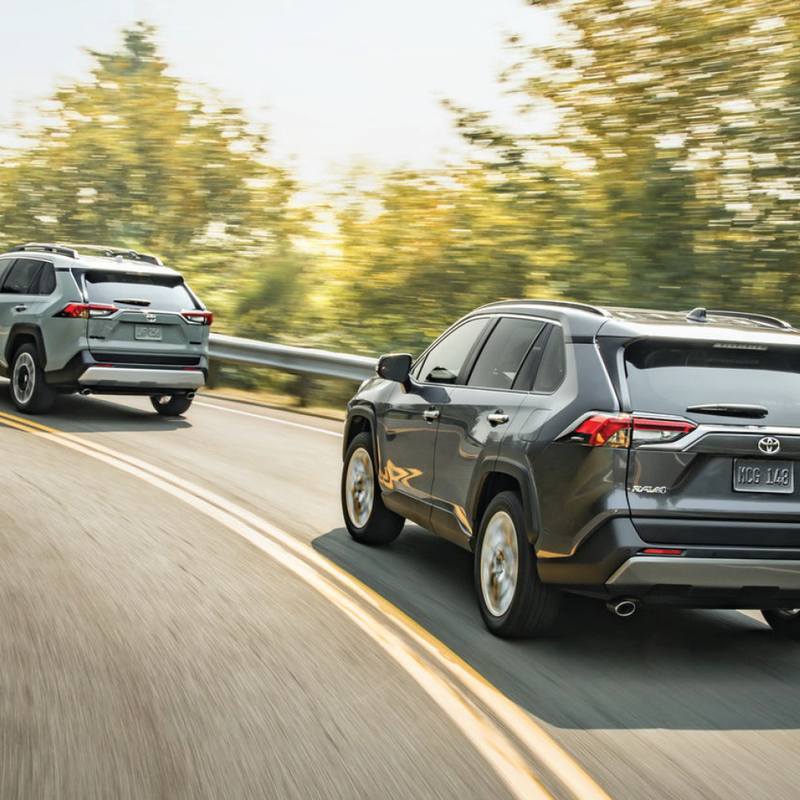 With Apple CarPlay® compatibility, you can use your iPhone with RAV4’s audio multimedia system to get directions, make calls, send and receive text messages, and listen to music while staying focused on your commute. RAV4 introduces Toyota’s first camera based digital rearview mirror. The available feature uses a camera mounted up high inside the rear window for a wider field of vision. An available Intelligent Clearance Sonar (ICS) audibly and visually warns you when it detects nearby pedestrians or vehicles. Under certain low-speed conditions, Rear Cross-Traffic Braking (RCTB) is designed to reduce engine power and if necessary, apply the brakes. An available Blind Spot Monitor (BSM) warns you when a vehicle in the next lane enters your blind spot on either side. When in reverse, the Rear CrossTraffic Alert (RCTA) helps detect vehicles approaching from either side. The optional Star Safety System™ includes six advanced safety features: Vehicle Stability Control (VSC), Traction Control (TRAC), Anti-lock Brake System (ABS), Electronic Brake-force Distribution (EBD), Brake Assist (BA) and Smart Stop Technology® (SST). Saftey and Security You can Depend on. Safety and security are paramount in the all-new Compass. Driver and passengers are protected by more than 70 available safety and security features. Drive with confidence as the Compass includes "safety cage" construction with more than 65 percent high-strength steel. Vehicle shown is for illustration only, and may contain optional equipment available at additional cost. Program and guarantees are subject to terms and conditions. Offered by Auto Exchange Military Car Sales Srl, Auto Exchange Kaftfahrzeug-Handels GmbH & Overseas Military Sales Corporation - OMSC Ltd.